A couple of days ago, I was writing a post about what a great birthday I had when I realized that I was actually justifying why Matt gave me a practical gift - as if it was somehow not good enough. It’s become second nature for both of us to assume the gifts we give each other are not up to some vague standard, even if the gift is exactly what we wanted. Several times over the course of our marriage, I’ve encouraged Matt to get me things for Christmas or birthdays that are of a practical nature - much like my birthday gift this year. The times he’s done it, he’s often felt that his gift wasn’t good enough. Not because of me, but because of societal (and occasionally family) pressures to make grand - and often expensive - or “romantic” gestures. Not that there’s anything wrong with grand gestures; I’ve had those from Matt as well. But when did it become a requirement that birthdays, Christmases and every other holiday must be recognized by material items with a certain price tag or from a certain category of giftdom? Matt struggled with this decision of whether to give a practical gift yet again this week. Would he be called out for purchasing me what is basically the equivalent of a vacuum cleaner? (Apparently, vacuum cleaners as gifts are a relationship no-no.) Would he be accused of hinting that the ironing needed to be done around the house? And since when did a simple birthday gift warrant such in-depth analysis (both what to give and the motivation behind the gift)? The insecurity he felt in giving me my lovely new cordless clothes iron shouldn’t be there. Why should the joy of giving someone a gift that you know they will want be overshadowed by the fear that outside parties may judge your gift and find it wanting? I feel absolutely certain that if Matt went out and bought me an iPhone 4G or a diamond necklace, there would be oohs and ahhs from each and every one of the five people who read my blog. But I didn’t want a new iPhone or a diamond necklace. If you’d asked me what I wanted for my birthday, I wouldn’t have even come up with the iron. I couldn’t think of a single thing I wanted so Matt searched his memory banks and hit the jackpot. When we got home Tuesday night, I got the camera all ready to record my special birthday. I wanted to take pictures and blog about the day because it had been so nice for me. I could sense hesitation about my announcing to the world that he bought me a clothes iron (hello, it’s cordless people - that’s sorta techy and cool and also I kind of like ironing clothes occasionally, a fact some of those five people who read my blog are trying to take advantage of now). After I caught on to Matt’s reluctance, I told him that I want us to start giving gifts to each other with only the other person in mind - and ignore whatever we think anyone else will say about our gifts. After all, we know each other better than anyone else in the world knows us, so I know Matt will thoughtfully choose gifts for me on those occasions when he feels it’s appropriate. And I will choose not to justify why he’s purchased a particular item for me in the future. Written in participation of Bigger Picture Moments, “A moment where you recognized the role your faith plays in your every day life. A moment where you take note of motherhood and the importance of what you are doing. A moment that made you stop and breathe in the bigness of it all. 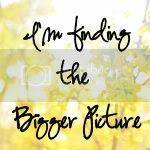 The hugeness that is life and the small moments adding up to one Bigger Picture.” Check out this week’s posts at Peanut Butter in my hair.